Things were looking pretty desperate for Parramatta when they fronted up to face the Raiders at GIO on Saturday night. That said, things weren’t all that great for Canberra either, since while they may have won their last match against the Bulldogs, they were also looking at a win-free season before that point. 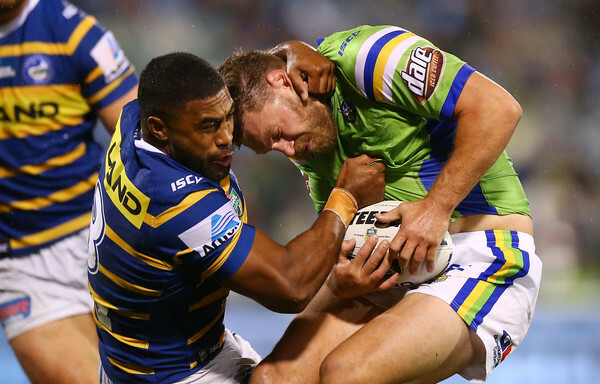 If it was important for the Eels to clock up a victory, then it was just as important for the Raiders to build on their first win, resulting in a pretty gutsy game from both outfits. The game felt all the more visceral in that winter conditions had clearly set in at GIO, at least compared to the Sydney heatwave, with the rain setting in heavily about five minutes into the match. The Raiders often thrive when the conditions are colder, and so it was at the beginning of this match, where they put down the first points of the game on the back of a brilliant tackle from Luke Bateman, who slammed Bevan French to ground just as the little backliner was about to return to the field of play. That massive effort paved the way for a Raiders set in which the green machine felt close to crossing over on every tackle. At first, Jarrod Croker took the footy over to the left of the field, where it took a pack effort from the Eels to hold him up, and even then didn’t quite get him to ground. In a testament to their playmaking prowess, however, Canberra now rapidly shifted the ball in the other direction, where Blake Austin came just as close to crossing over on the right edge of the park. Once again, the Parramatta defence held him up, but a quick play-the-ball from Austin gave Joey Leilua the opportunity to shift the Steeden rapidly across to Jordan Rapana, and with only George Jennings in place to handle the two of them it was inevitable that Lepana would strike again. While Croker may not have managed to add the extras, the spectacle of Rapana and Leilua adding up so seamlessly was galvanising to the team, and a couple of sets Rapana seemed to have scored again. This time, it was Aidan Sezer, rather than Leilua, who set him up, thanks to a penalty from Mitchell Moses that gave the Raiders another opportunity on the Parramatta line. In one of the bursts of inspiration that can make Sezer so sublime, the Canberra halfback glimpsed space out on the right edge, and chipped the footy across on the first tackle. The kick was all the more gutsy in that there were clearly Parramatta players closer to where the football would land than Rapana, but Sezer rightly recognised that his winger would have the speed to beat them all to the grounding. Unfortunately for the Raiders, however, Clint Gutherson spoiled Rapana’s party, if somewhat inadvertently. Trying to avoid knocking the footy on himself, Gutherson’s right knee struck the Steeden moments after Rapana had lost it out of his left hand. While Rapana might have regathered it beautifully a second later, the contact with Gutherson was enough for his putdown to turn into a knock-on, although the spectacle of his linkup with Sezer still made it feel as if the Raiders were in control. Sure enough, they crossed over shortly after, this time on the back of a penalty awarded to Kaysa Pritchard for a strip. With Corey Norman overchasing to leave a massive gap on his inside, and Tepai Moeroa grounded with an injury that saw him taken off immediately after for an HIA, it doesn’t really make sense to say that Austin sliced through the Parra defence. Instead, there was no real defence to slice through, to the point where I initially assumed there had to be some kind of error in the Canberra backplay, so effortlessly had their five-eighth managed to put it down. The only error had been with Parramatta, however, and with Croker adding the extras the Raiders were now 10-0, although even that scoreline probably didn’t reflect just how ahead Canberra seemed to be. As the clock wound down to half time, the Eels seemed more and more exhausted and dispirited, with many of the big men standing around with their hands on their hips or behind their heads, and their organisation and focus feeling more and more precarious with every moment. Only a penalty goal right on the siren saved them from going into the sheds pointless, but even then this first half has to stand as one of the direst moments of Parra’s 2018 season so far. If anything, Clint Gutherson had brought the most energy, with neither Pritchard, Moses or French managing to get in a run during the entire forty minutes. They were a depleted team, and the Raiders made them pay for it shortly into the second stanza, when Josh Papalii compounded Canberra’s more strategic tries of the first half with a classic strength try right next to the posts. Once again, it came off a period of sustained possession and field position for the green machine, along with a bad read from Pritchard, who tackled Shannon Boyd too early, leaving space for Papalii to catch the footy on his outside and slam through a combined tackle from Norman and Ma’u. Things now went from bad to worse for the Eels, as a high shot from Moses on Whitehead bled their eleventh penalty of the game, with a slow peel from Daniel Alvaro on the next tackle making their twelfth. With Alvaro sent to the bin, and the Eels now leading the penalty count 12-5 (and 6-0 already in the second half), the stage seemed set for a Canberra landslide, especially once Moses kicked too far and gained the hosts a seven tackle set, and Kenny Edwards came up with an error at the end of a Raiders set shortly after. Yet Canberra were so confident that they didn’t quite have the urgency to make the most of this sequence, even if their superiority never really felt in question either. Things momentarily looked up for Parra when the Raiders came up with three successive penalties of their own, and Luke Bateman was sent to the bin until the final minute of the game. For a moment, the Eels even looked as if they might gain some momentum, as Kirisome Auva’a crashed over for a try that was eventually disallowed, as the Bunker deemed that Havilii hadn’t got a sufficient chance to tackle Moses. From there, even the first run of the night from French – five minutes out from the end – couldn’t give the Eels any hope, or any shot at a genuine comeback. By the time that Bateman finally returned to the field, it felt more like Canberra had gained an extra player than “made up” for only having a twelve man outfit. Meanwhile, the Eels had been held tryless at 18-2, despite having Gutherson in their lineup, in one of their most devastating losses in a season entirely characterised by devastating losses. Even the return of Jarryd Hayne can’t fix this situation overnight – his presence might even exacerbate it in certain ways – and they’re now going to need to treat every match as a rebuild to avoid taking home the spoon this season.